Kids L-O-V-E popsicles and if you combine chunks of juicy watermelon, frozen lemonade and popsicle sticks together, it will soon become a summer favorite! We have a delicious and healthy frozen pops recipe that kids of all ages will enjoy. Ingredients 5 cups	(1.25 L) chunks of seedless watermelon 1 frozen can of lemonade 10	ice pop moulds, each about 1⁄3 cup (75 mL) Directions 1. In a blender or food processor, whirl watermelon and 1 can of frozen lemonade until very smooth. 2. Pour watermelon mixture into moulds. If using wooden sticks, fill moulds 2⁄3 full. If using plastic sticks with rims, fill moulds full. 3. Freeze until firm, at least 6 hours or preferably overnight. 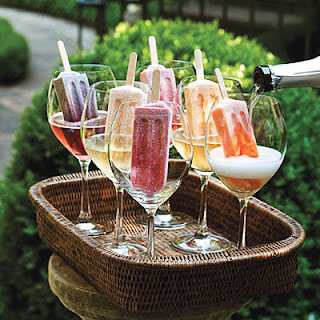 Ice pops will keep well frozen, up to 2 weeks.